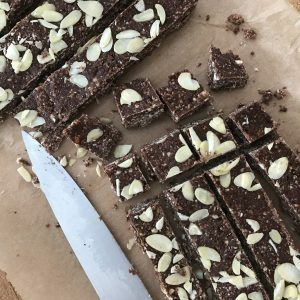 I’ve been making this no-bake chocolate and coconut slices recipes for years now! It’s easy to make and full of great ingredients and just really tasty. We make slices but you can also roll the mixture into balls and make no-bake chocolate coconut balls. Maybe ask your children why they prefer and you will see, once you give them the choice they are even keener to taste, try and eat when you present them with new foods. Not that that will be necessary with this recipe, it’s just too good! Remember: Although all my recipes are refined sugar free, it does not mean that we should eat unlimited amounts of them! We are making something sweet, so let’s remember: we will have less of it! Is there such a thing as a healthy sugar alternative? 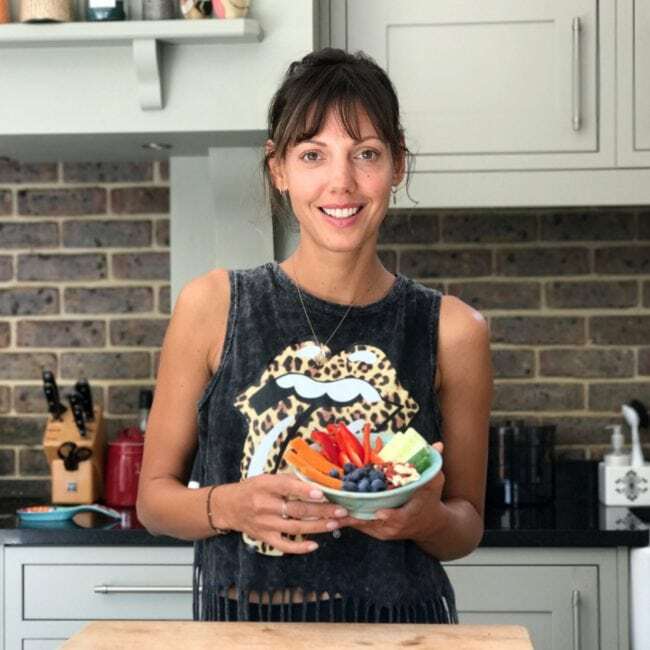 For a better idea about what sugar does to us I have come cross this fab article by Emily Wright, over on www.sneakyveg.com. It really helps demystify! We sometimes press faked almonds into the topping of the mixture, other times desiccated coconut, or even sesame seeds work well. 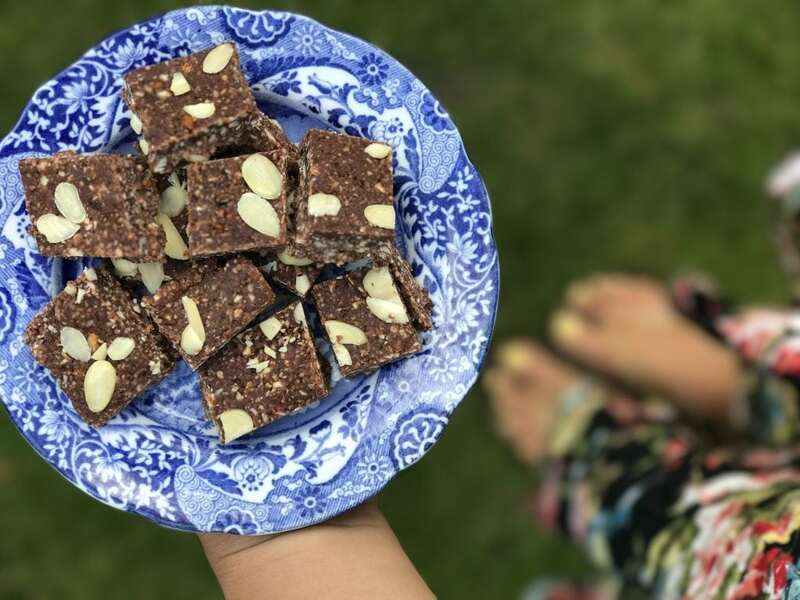 The no-bake chocolate and coconut slices will always look so different and although we keep the recipe the same it always feels like we are eating something new! Line a 20cm x 20 cm square tray with baking paper. 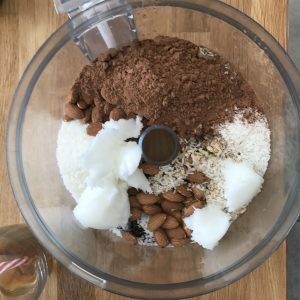 Place the almonds in your food processor first and blitz tip fine. Then add oats, desiccated coconut, cacao, dates, coconut oil and maple syrup into the large bowl of the food processor. Blitz until the mixture comes together. If needed, with the motor running add 1-2 tablespoons of water and blitz until the mixture comes together. Spoon mixture into the prepared tray, top with a sprinkle of coconut (or flaked almonds)and freeze for 1 hour until set and firm. Store your slices in the fridge in an airtight container. This is super easy: everything mixes together in one go! Don’t worry if some slices break when you cut them. Just wait for ten minutes once you take the tray out of the freezer and the mixture become less brittle to cut.